PHILADELPHIA (AP) — Joel Embiid once had to spike his dad’s wish for him to become a volleyball player. 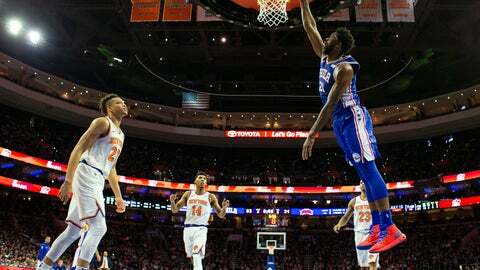 With his father making a rare trip to Philly, Embiid showed once again he was wise to ditch digs for dunks. “Embiid was doing some damage in the post,” Knicks rookie Kevin Knox said. Embiid’s spin move into a one-handed jam earned a smile and applause from Thomas Embiid, a colonel in the Cameroon military who is visiting from the family’s home country and plans to spend a few weeks with his MVP candidate son. Growing up, Embiid had to convince his father that basketball wasn’t a dangerous game and he didn’t have to abide by Thomas’ wishes of becoming an elite volleyball player. He didn’t stick around to offer his usual quips and one-liners to the media — Embiid split to catch up with his family. Philly’s last home game was a rare disaster, a 121-112 loss to woeful Cleveland on Friday. Coach Brett Brown said the Sixers didn’t play with spirit against the Cavs. They played with purpose against the road-weary Knicks. 76ers: The Sixers hope to provide a medical update on 2017 No. 1 draft pick Markelle Fultz on Friday. Fultz has not played since his agent shut him down and wanted an examination of the guard’s right shoulder. Fultz had said he wasn’t hurt and the decision came a day after he appeared to lose his backup point guard spot. “There’s been nothing more to talk about,” Brown said. “I do concede that he is going to need it at some point but I definitely don’t think it is going to define him,” Brown said.